The Ohio Lottery was established to support education programs. The Lottery is a game of chance where participants attempt to win monetary prizes by choosing winning numbers. Ohio Lottery games include the Kicker, daily Pick 3 and Pick 4 games, Rolling Cash 5, Keno, Powerball, Mega Millions and Buckeye 5. There is also an assortment of instant games, where a player can just scratch and win. At any given time, lottery agents throughout Ohio sell approximately 40 “scratch-off” instant games. Total instant and on-line lottery game sales in fiscal year 2011 were $2.6 billion, ranking the Ohio lottery ninth in the nation. The 2011 fiscal year sales was an all-time record high. 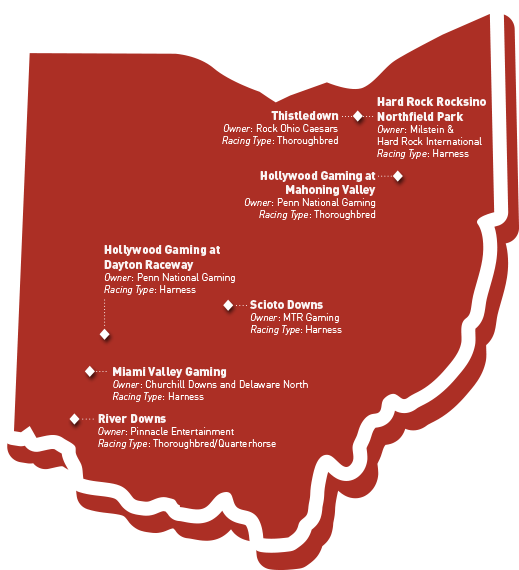 Ohio’s seven horse race tracks are permitted to conduct video lottery sales. Each track may obtain a license to operate up to 2,500 video lottery terminals (VLTs). For more information on the Ohio Lottery, visit the Ohio Lottery Website. Players choose five numbers for a chance to win $100,000. This game is offered four times a week on Monday, Tuesday, Thursday, and Friday. Customers can play twice a day at 12:29 PM and 7:29 PM. There are many ways to bet. A player can choose a straight bet, boxed bet, back-up bet, pair bets or wheel bet. EZPLAY Games are instant play-style games generated through the lottery terminal, with no need to wait for your numbers to be drawn to win. Tickets are sold seven days a week, and drawings occur every 4 minutes from 6:04 a.m. to 2:28 a.m. This option can be added to Super Lotto Plus by checking the Kicker box on the Super Lotto bet card or by asking the retailer to provide the Kicker along with the Super Lotto bet. A player wins $100,000 by matching the computer generated six-digit Kicker number in the exact order, $5,000 by matching five digits, $1,000 by matching four digits, $100 by matching three digits and $10 by matching 2 digits. For each wager, players can select five numbers from a pool of 1 to 75, and one Mega Ball number from a second pool of numbers from 1 to 15. There is the option to play up to five times on each ticket and drawings are held every Tuesday and Friday at 11:00 p.m. EST. Players select five numbers from a pool of 59, and one number from a second pool of 35 using a bet card. Drawings take place every Wednesday and Saturday at 11:00 p.m. EST and once bet cards are submitted, all sales are final. Drawings are held daily at 7:05 p.m. Players must match all five white balls to win the jackpot. Players choose six numbers from 1 to 49. Drawings are Wednesday and Saturday nights. The customer chooses to collect either a lump sum or annual payments. Ohio has six VLT locations. 1. How do I become an agent? If you are interested in becoming an agent, contact the Ohio Lottery Regional office and request an application packet. The Lottery Commission requires you to complete the application, consent to a background check and show proof of a $5,000 bond. The license fee is $25.00. In most cases, you will be required to sell instant tickets for at least six (6) months before you can apply for a license to sell online lottery tickets. Notify your lottery sales representative who will provide you with the application and assist you with its completion. The Lottery Commission will distribute the online lottery machines to approved applicants based on total instant ticket sales. Therefore, it is important to note that you may be approved to receive an online terminal but because of low instant ticket sales, a machine will not be given to you until first offered to those applicants with higher instant ticket sales. 2. Do retail agents receive a bonus for selling a winning ticket? The amount given to the retail agents is determined by the game. Agents receive a $10,000 bonus for selling a winning Super Lotto Plus ticket, a $1,000 bonus for selling a winning Kicker ticket and a $500 bonus for selling a winning Buckeye 5 ticket. 3. How much of lottery profits are given to education? There are different commitments determined by the legislature for each fiscal year. For fiscal year 2000, the lottery gave $608 million.